Enter our new contest! Awesome J and B Lures! Dennis has a new report up. Off to physical therapy. yuck-- see ya. Dennis put up a new report! Thanks Dennis! I just love the new colors I am playing with on this page! I feel like a kid coloring! Off to physical therapy. Yuck. Garabaldi Marina reports there are fish being taken out of the Coast Guard hole and the Ghost hole. Three last weekend and 2 a couple days ago. She says pressure is very light though. Maybe I will go increase that pressure today! No, our house is not for sale! The neighbors are again trying to sell the lot next door. They put a sign up that is a bit misleading and people trail down to our house to inquire about it. Man, we get tired of that. Makes me want to put up signs myself that say... "House not for sale... Wetlands lot next door only." or "Riparian zone, no tree cutting." "Keep out, beware of dog". "Artillery practice range" or if they knock on the door have the kids answer and say..."Just a second, we have to chain up the guard dogs." Of course I am kidding, but it really does get old, playing real estate agent in a place where we moved to get away from constant traffic and solicitors. Don't get me wrong, we have great neighbors, I enjoy them both and that is such a relief, but this sign drives us crazy! Plus, my office overlooks a beautiful meadow... (Theirs at this point.) Its just ugly with this big ol sign sticking out. I'll pray for a windstorm. The Columbia below Tongue Point reopened yesterday to include a Chinook in your catch. The biologists say that the run, however, is virtually over. They do expect Coho angling to be good and getting better for unusually large Coho. 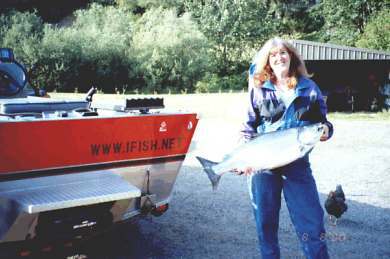 The Nehalem is producing sporadic catches. A few Chinook for many, many boats. Kind of like playing bingo. Boats are starting to appear on the Ghost Hole on Tillamook Bay as rumors are circulating about a few Chinook catches. Just remember that the bay downstream of Kinchloe point including the triangular zone outside of the mouth of Tillamook Bay remains closed until September 16th. We wish it were open as it was in the early 90's when Chinook angling there was excellent around Labor Day with little competition. Remember, this year is the first year in a long while that you may retain Coho. (Finclipped only!) The Coho may only be retained through Sept 30th. Bobber fishing opportunities from the bank should start to pick up in a few weeks in the coastal streams. Get those reels cleaned and start putting on fresh line now! Gear up for a great year here on the North Coast! They say cell phones distract you from driving safely. What about the scenery at the coast? Now THAT is distracting! I do think I see things differently from most people. I'm speaking of strictly visual acuity. Let's not talk about what I don't see, there is plenty of that. I remember right after my eye surgery that immensely sharpened my vision. I came home to find spots on my walls, a dirtier house than I remember living in. It was incredible! I called my sister and told her I was cleaning house. Her reply? "Oh! Getting your house up to 20/40?" Yes, the dirt in my house (and the newly discovered wrinkles around my eyes) had been caused by an increase of vision. Thanks ALOT, Doc! Sometimes what I see is so incredible that it causes me to be distracted. I can't help but stop and stare, thus I really should pull the car over. Yesterday it was the clouds. There were these huge cumulous clouds hanging directly over the mountains. Huge cotton ball kinds of clouds, all in a varying palette of whites and grays. Hanging down from the Mother clouds were these finger like tendrils, that seemed to be sucked down by some sort of vacuum. They were randomly lacing the tops of trees and disappeared as if being pulled deeply between chosen areas, somewhere down into the forest floor. In shocking contrast, the sky was blue, the pavement was wet and the sun was blinding, shining through the clouds and casting an eerie hue in the air. The mountainside was a deep shade of green and the stripes on the road so bright that I reached for my sunglasses. I should have pulled over, but I didn't. I just drove in awe as I turned each corner and revealed a new cloud decorated hillside. What a ride! When fishing is slow on the river, some get bored. I don't, I hunt for agates. I search for birds. I want to see things, to discover things first. It is a self competitive thing with me to find things. I got so frustrated as a child listening to my Father say, pointing out an eagle, a deer, "Don't you see it? It's RIGHT THERE!" As a small child he even convinced me you could see Japan from our Coastline. "Oh, yes, I see it!" I walked down the to the river yesterday, hoping against hope that the recent rains had brought the cutthroat up river as far as my favorite hole. The rocks were wet, and as I stumbled over the small boulders, I stopped to pick up undiscovered treasures. The kids and I had tromped over these agates day after day in the summer sun, hidden by the dust and dryness. The rain had made them visible, those translucent little beauties that appeared from nowhere because of their wet shiny surface. A gift from the rain! I am learning that the world is so much more than what you set out for. Along the way to any goal, whether it be a fish, or the completion of any task. Keep alert! There are treasures along the way! They have come to me in the form of undiscovered natural treasures. Agates, cloud covered mountains, deer, or something as small as the tiny veins in a leaf. They have also come to me in the form of friends I never thought I'd meet. All from an internet experiment called Ifish.net. I just wanted to learn to make web pages! Yes, cell phones are distracting. Beautiful coastal mountainsides, scenes like that from Neahkanie mountain, fishermen with fish on at the Nehalem.... These things distract me far more. I drive North to Astoria from Tillamook every week to play piano. The drive is long and gets tiring. I have realized though, that it brings things into vision that I hadn't noticed before. My eyes have been filled with undiscovered treasures. No, nothing on T bay today. It was gorgeous though. Still clear water, lots of those "try and catch me" seals poking their heads up. Very light pressure, no fish heard of. Very few marked on the fish finder. Why do they call it a fish finder if they can't find me a fish? Nehalem Bay: Still nothing to speak of despite occasional rumors to the contrary. Roy Creek area: Big rumors of big fish and lots of limits last Saturday. No confirmation, but there were numerous vehicles parked in that area midday Sunday. Everything has abandoned me! (Bill just took exception to this!) My birds are gone. Haven't seen a hummingbird, a grosbeak, a pine siskin or even my goldfinch friends in ages. We are hoping the first real fall storm not only bring fish into the river, but the return of those cute little towhees, the beautiful flickers and the masses of brazen juncos. I remember my porch just packed with little bird customers! By then the trees will be clear of the leaves that block my view, thus hopefully allowing sitings of the spotted owl that lived across the river last winter. I am so fickle.. Along with the thrill of fall comes the sadness of a lazy summer once again missed. What is a lazy summer? I remember them from my childhood, but I can't duplicate them with my children! The luxury of boredom! I think of sitting in the front lawn for hours, picking long blades of grass and making them whistle between thumb and forefinger. Perfecting the tone until someone came along with enough money to go to the Dairy Queen for ice cream. Trying to ride our bikes home before the ice cream would melt down our arms. Sitting on the lawn again, waiting for the next big event. Neighbors coming home, the newspaper boy to flirt with... something! This year I planned several days of floating the river with the kids. We floated maybe 5 times. I am guilty of hurrying them, driven to the goal of reaching home. We would linger for a while at certain holes, naming them, checking for diving depths, searching for agates, climbing the rock walls, but not long enough. Surely not long enough, because we are not still there. Summer has gone. The sounds of kids slamming doors, giggling, clanging glasses in the kitchen are sharply absent. The house is a hush, with only the sounds of my keyboard clicking away the thoughts in my mind. Time to file away these memories while I squeeze the air out of the raft and file it next to the inner tubes that all waited by the river for just one more run. The sun is shining, it's warm out...... Should we???!!! I have fished the Nehalem twice this week with no luck. Yesterday I jumped in the boat so plum excited and positive about catching that I totally blew my theory that that has an effect on things. I used to think that positive fishing produced fish. Hmm. I guess I'll just keep drooling over this one. I spoke with an interesting fish biologist from the Newport ODFW office who is doing some research on Chinook. He is doing some fin clipping and radio tagging, Then checking carcasses up in the spawning beds. I am going to call him again and get some details. Perhaps I will do a story on what he has learned. I recently looked into the financial aspect of getting married. I found out some gruesome facts. If I were to become married, I would lose my high risk insurance and have to pay up to 700 for the same coverage. I would lose Andrews also, same story. So for 1400 a month I can do what I have always believed to become right with my God. What a deal! Somehow I can't believe my God would agree with that. Let's get together and rob the disabled people! When I think of the heart tests and eye surgeries that are common with Marfan Syndrome, and the even scarier aspect of heart surgeries, I just can't take that chance. Maybe someday..... The whole thing makes me sad, mad, discouraged, and besides, Bill hates me to write about stuff like this, but I must VENT! I have written to Congressmen and Senators until I was blue in the face. When I was newly divorced, I wanted to work to support the kids and myself. Hey, "Great!" they said. First we'll take away your health insurance, any and all assistance from us, and you'll be half as able to be independent! Seems I was better off being totally dependent on the government, (I would have been, should I have been able to swallow my pride) even if that was not what I wanted to do! I worked anyway, until I was able to do it mostly on my own. Something is wrong here, ladies and gents. Finally they have a program in place called the EPD or something, Employed people with disabilities act, that allows you to work and retain your health insurance, but only under certain rules. ARGH. OK, my frustration is filed and put away, now I'll be happy again! I'm taking off for a weekend in Seaside with my kids. I'm going to walk the prom with an umbrella, eat elephant ears, play arcades and pretend that I am 15 again. This is in between piano playing jobs that I have scattered throughout the weekend up North. So, one minute overalls and rain boots and the next, high heels and a blazer. When I return home the river will be high and muddy, right? Ohhhhhh I hope so! Lets see, pizza, sub sandwiches, potato chips and ice cream, pronto pups, taffy...Yip, that's why my scales reflect the change. What fun though! I was transformed into a kite gazing kid in Seaside this weekend! Staying at the Shilo on the prom forced us to play with the tourists, smack in the middle of the kite festivities and the Roadster Show! When I lived in Astoria, I rarely went to Seaside, but now I know why it is so crowded! It was so fun to have a motel room that allowed me to just walk out the door into masses of people, smiling, having fun! Oh! The kids and I found a wallet with money and credit cards, went up to the room and called the police. Anyway, a happy owner was found, and when she saw the wallet, screamed with joy, gave me a hug, and offered $10 to David. He didn't take it! He is such a good guy! The kite festival was amazing! There are master casters, such as Stan Fagerstrom, and then there are master kite fliers! The wind was strong and the clouds were low, a real Oregon Beach experience! Music was played on the beach. The kite fliers made their kites lift higher in the air with the crescendo, swaying back and fourth in the wind with the beat of the particular tune. The bass would boom, and the kite would hover tentatively, inches off the sand... then the orchestra would soar, violins screaming as the kite would lift into the sky, higher and higher with the increasing tension of the Star Wars Theme. I stopped in my tracks, I had no idea they did this with kites. Frankly, it was one of those experiences that somehow make my eyes well up with tears and get the sup sups. Over stimulation, I think it's called. My kids acted like they didn't know me and left to find their secret Dr. Pepper buried in the sand somewhere and marked with a homemade flag. I stayed, feet planted in the ground, my body braced against the wind. I realized I couldn't quit staring, so I knelt down and sat in the sand, eyes fixed on the sky, cold wind blowing, and I, totally absorbed in the show! Then there was the Hot Rod Show. They parked all these beautiful old cars along the Prom and didn't allow any other traffic except pedestrian on the prom and at 6:00 began a parade. I wanted so badly to sit in one of those rumble seats! Loud glass pack exhausts and revving engines filled the air as flashes of overly glossed cars and trucks from the past drove by in every color you can imagine! An eye festival! Fascination: A game at Seaside that should own its own 're hab' center. It is a mind dulling game where you roll the ball for 25 cents to get a bingo. I could have stayed there all night. It chased away any and all serious thoughts from my brain except for the craving to have an ice cream cone in one hand. All weekend I didn't even think of fish until I drove past the Necanicum and saw anglers by the side of the river. I talked to one of them who said the Salmon have been spotted. A couple rolling huge Necanicum salmon in the river. WHEE! What memories that brought back! At the 12th Avenue store, I forgot to check if they still had my picture up with the nice fish I caught, oh, say 15 years ago. I wonder if it is still there. I hope not, I had short hair and was pregnant when I caught it. I think I was as fat as the fish I caught! Anyway, back to reality here, back to being an adult. But back also to fishing. Fishing is grand, but catching is better, and after this weekend, that is what I need to get over stimulated again! I am no great hunter of fish. Just ask my cat. He is a great hunter. Well, not of fish, but of everything else. I wake up to find assorted tails and feathers anywhere from my bathtub, (his favorite dissecting area) to the living room rug. Cleaning house is a nightmare. On the entry way rug lay a half eaten mouse. Just the head was gone. I fear for my life, my children's lives. Soon will he hunger for the taste of just one finger? His name is Jack. I wanted a cuddle cat, a 'drape across the couch' kind of cat. I got a cat with extremely long limbs and an extremely active personality. The "Marf cat" we call him, as people with Marfan Syndrome often have very long limber joints. This is Jack to the T. He is all legs and creature killing arms. Every time he brings in a bird we are more than sad. We thus enamor him with one more bell. A reward system of sorts. We bought a whole bag of them. We are ready. Every week at church I am told by a select group of relatives about a chocolate lab that needs a home. It haunted me week after week as I played through the pros and cons of even visiting this dog. I have become very close to Dee Dee, Bill's big lab, and what would I do with two attention seeking lap dogs? How do you divide your love? I am a loyal 'one dog' kind of gal. "You really should come see Hershey." My mind swam with emotion, confusion, coincidence, disbelief! O.K.! Let's go see Hershey! The kids and I piled into the car and followed them to the man's brothers house that owned Hershey. I held the dogs head in my hands and was driven home to 15 years with this same dogs eyes and wiggly excitement. My Hershey.... and my eyes started to well up with tears. Memories. The owner was not home. We called repeatedly for hours until we finally reached him. We had been assured this dog needed a home. Turns out the daughter, away at college is very firm about not losing her childhood dog. I can understand totally, but the experience has left me knowing that I need a chocolate lab. A chocolate lab puppy that will bring me home to the dedication of a dog that looks up to me and knows he is mine. This Hershey, that was to be given away has a girl that he knows as his owner. It is not me, and it would break my heart to see her searching for her owners while we would go through the change. Sure, this dog would probably adapt, but I want my very own, that would grow with me, just as the 'other' Hershey grew with the girl that has left for college. Still, it breaks my heart to know that this dog sits out in her pen waiting for this girl to return home, listening for that car coming into the driveway... endless hours and days of waiting. To be let out to run and race, wagging his tail with the little girl that he grew up with. Reminds me of that stupid song I hated so much as a kid. "Puff the Magic Dragon". The first time I heard that song in kindergarten I cried, thinking who could write such a thing? "Puppies live forever.. but not so long...."
I want to love this other dog Hershey, to run with her, to fish with her, and to make her wiggly and happy again. It is the save the wounded bird syndrome, I know and I can't save them all, but I know it is a waste to not share the love I have for dogs, and get myself a puppy. Imagine this: You are drifting down the river fishing a hole, and along comes Scott Amerman behind you. He fishes the stretch that you just thoroughly worked. The water where he is fishing suddenly breaks into action while his client yells, "Fish on!" The first thing that goes through your mind is this. It's his eggs. The famous North Coast Amerman Eggs. Finally you can order some of these eggs yourself, right here on Ifish! Scott came by the other day to talk with me about the possibility of having his eggs for sale on ifish. I jumped at the chance to share this with you, because I have always wanted to try these eggs, and finally I have some in my very own refrigerator! They are beautiful! I can't wait to try them! Read about them here, and give him a call. He also sells fresh eggs if you prefer to cure them yourself. Man, are they nice! I was driving along the road two days ago with Bill, when he abruptly stopped the car. "You have to see this." He backed up and I saw a small mound of fluffy fur in a dusty driveway, dangerously near the road. Sometimes I just act upon total instinct. I grabbed that little kitty, whose eyes were crusted shut with infection. Her matted fur was filled with lice (yuck) and she attempted a very pitiful meow-like help to me. She was so hoarse from lack of water that she let out a froggy croak instead. "To the vets!!!" I said to Bill, and without hesitation or argument on we drove. Fifty six dollars later I am home bathing a cat with anti-lice shampoo, applying eye medicine and giving oral antibiotics three times a day. But wouldn't you too, for this? The kids want to name her perch because she perches on any part of you that is near her. Somehow she is more feminine to me than that though. Any suggestions? Fishing seems to be picking up around here, I'm going to go check it out for sure. I have heard some very encouraging things. Not ready to share them until I find out for sure! Marie of Tillamook Bait sent in these great pics of some Pacific City hogs caught recently. No decals yet. Will they ever get here? I was going to go fishing with Jim Erickson today, but he changed plans and they didn't work for me, I didn't have enough time to float the river on an all day trip. So here I sit patiently awaiting the UPS man. I didn't have anything better to do, so I decided to have four 12 year old boys for a campout for David's Birthday tonight. Am I crazy? I think so. It'll be fun, right? All I have to do now is make a cake, set up the tents, buy the pizza and hide in my room for the rest of the night! Oh! Then I'll have a small party for the entire Ifish gang next week! I have nothing to do! I'll just go fishing! Yeah right. I may go sneak out and try some jigs on the upper Wilson to ready myself for the battle. Oh, good idea! I'm outa here! I get many things done procrastinating! Hey Ho! Still alive after the slumber-Birthday party! Heard the Nehalem produced today. I think I may rush to church, rush back and catch one of those beauties. Oh, look at the confidence! Wheeee! Opening day today for so many things! T bay opener! Bait open in the Kilchis? For WHAT? The river is full of smolt and fingerlings and trickles a little stronger than my bath water going down the drain . I'm desperate, but I'll leave the babies to their play pen. Oh! The Party! Wheee, this weekend!! I'm being brave by announcing it, huh?! I only have 5 zillion things to do, but hey, that's a normal day, right? E mail me for details if you are amongst those who have not been informed. Still no decals. I don't know what is up, but I am counting on Monday. Off I go, bedtime for those of us who live by the rising and setting of the sun. That's me. Always been a morning gal. Oh! One more thing.... My kitty, my baby doll kitty, my sweetest little thing... Her name is "Ginger". She is playing, and eating, and totally healthy! I love this cat SO much! The decals finally got here! I mailed all of the pre orders out. Thanks for the patience, and I hope you enjoy seeing other ifish people out there! I know I will! Another reason to smile and wave! Yesterday, playing for the choir, I had the worst time I've ever had. All of the sudden reality really hit me. My sight really isn't so good! I couldn't see the darn choir director's hand, couldn't read the music, thus couldn't play as well as I am capable of! Now that is frustrating! It was all of the sudden so real. I felt sorry for myself in the worst way. Then I realized something. You know, I have always been good at accompanying talented instrumentalists and vocalists. I had this uncanny knack for knowing when they were going to begin playing after a phrase, a pause, or when they were going to build, or suddenly go quiet. This is because I never relied so heavily on visual things! You know, they say that when one of your senses is taken away, your other senses grow keener? They do! I realized I have always relied on listening to when they breathe, feeling the air around me when they grow tense, and I know that something big is about to happen... like a crescendo to a forte', or... I don't know, hard to explain, but there are good things about not seeing so well. Like this song I wrote and a friend of mine, Mike, who wrote a poem about my sight, or lack thereof! I haven't looked at these pages for a long time, so I hope they are still up! So, after church, I run to the girls room, throw off my heels, and jump into my jeans. Out the door I flew to my favorite jack salmon hole. (A friend wrote about it here. I wrote the music, he wrote the page.) I am crazy about jacks, that is why I wrote a song about them here too! Anyway... I run out there, and the tidal overflow on Young's Bay where I fish was totally still and quiet. The reflection of the sky is absolutely mirrored in the placid water that I sat next to. I didn't think there would honestly be fish, and I didn't care. I just needed a time to be quiet, to think, to be alone with the water. So I began to play a game. The sky was overcast with blue sky peaking through here and there. Since the water reflected it so perfectly, I casted into the blue bits of sky on the water. Then the wind would pick up a bit, erasing the image on the water like the shaking of an etch-a-sketch. When the reflection came back, I had a totally new slate to cast upon, thus covering more water with each wind change. Then I got tired, not getting a bite, so I began a new game, all the time erasing any stress or thoughts of business, or eyesight, or anything from my mind. Birds would fly overhead, and I made myself guess what kind of birds I saw without looking up. I only had the water to tell the tale. Blue Heron? Seagull? Geese? It was so fun! Until..... My bobber got attacked by a Jack Salmon! Wheeee! There is more to this game than the pretty reflection? Down went my bobber, and I was into a hot bite for, oh say, 10 minutes! I would reel one in, and then barely have time to get my line in before it was time to fight another! At the end of the bite, the sky had cleared, the slough was choppy with N.W. winds and it was time to say good bye. As I got up, I noticed the trash at the rivers edge, left by other anglers. I walked around, picking it up, grateful for the sight I have to do this, and kind of grateful that my sight isn't better. As well as seeing beautiful things more beautifully, you would also see the ugly things quite more vividly, I would suppose. I drove home through the beautiful coastal mountains, cliffs that overhang the deep blue sea, and deep lush forests that were sprinkled with gold and the first hint of fall. The air was still. My mind was still. I had fish. Life isn't so bad, is it? Ginger the new kitty came to us weighing in at 9 ounces, with a head bigger than her stomach. Now the reverse is true. She had elk steak last night and jack salmon trimmings today. Happy cat! Off to go take some decals to Marie at Tillamook Bait. and focus on how she hurt us. yet see only the mess they make. yet we don't take the time to call. yet long to have more property. and discount it as too small. we call her and smile at who she is. and we visit with them. we are safe and warm. we cook it with wild abandon, and have a feast. and marvel at its wonder. we bask in the sunshine, play in the snow, dance in the falling leaves. Isn't it amazing? Aren't we lucky? This is my prayer of thankfulness today. My prayer that I will slow down, appreciating the simplest of things. I will enjoy and savor the companionship of those around me, knowing their faults, yet choosing to see the joy they have brought into my life . Eleven years ago this summer my neighbor in Warrenton was moving. She brought over miscellaneous items she didn't care to pack along. Along with these items were three Tiki torches. For eleven years I have packed these torches around from house to house. One day, I thought...I'll have a party. An outside party, with lights twinkling in the trees, people mingling, laughing, talking, trees swaying in the breeze and...tiki torches, flickering their tropical flame in the background. I was so excited as I headed out the door one day and saw them, spider covered amongst some old tools in the cedar barrel. Hah! My Tiki torches! I can use them! I dusted them off, glanced inside and noticed the fuel cans had been tossed out halfway through their unused life span due to rust. No problem, I thought, I'll go to Freddies to get some new ones, and we'll be set! I put the lights in the trees, stuck the Tiki torches in the ground in a very thoughtful manner. Perfect! I casually stopped by Freddies to inquire about the missing items. "Seasonal item, ma'am, we are fresh out." Freddies in Astoria... "Seasonal item, ma'am, we are fresh out." It has become back seat to preparing food, to finding boat seats for friends, for marking out parking spots. I WANT MY TIKI TORCHES!!!!! The party is still on, but friends and neighbors here at ifish.... if you have a spare can for a Tiki torch, won't you just let me borrow the can inside it to light at least one of those torches? You know, a kind of.... "Come on baby,( let) me light my fire????" Otherwise, the tikis are going in the trash burner. I mean it!!!! I have just been informed by my editor, Pete Morris, that I have totally screwed up my dates. It is a fact. I have no idea who I am, what day it is, or who is having a party this weekend. I am very picky about where to stay when I go places, but this is one place I would want to go even though it is only 10 minutes from me! What a place to stay! Right by the Memaloose boat launch! Can you imagine living here? O.K., dreams aside, what about a family weekend here? Check it out, a major fishing dream come true! I can imagine it now.... Getting up early, having your boat already at the dock, kids still asleep. Grab a hot cup of coffee and sneak out for a quick fight with a 30 lb Chinook! Back to the house, wake the kids and rig them up. Go back for more! Even without a boat you can fish from the dock. Let me tell you, this is my kind of place! Sittin on the dock of the bay... AHA! Click here for some great pictures! After today, you will find the link under accommodations on the left hand column. Send me your report after you stay there! No kidding, if it weren't for Pete Morris, this page would be a mess! I owe him big time for the new neat links, updating me on broken links, and checking my dates on this journal. Thanks, Pete! Porta Tinkle is in place for the big weekend. It looks so new and nice I don't want to use it! Someone has volunteered to bring me a Tiki torch or two! I love it, although I still can't use mine. Almost as good though! So, I am almost ready. I may take a short break if I get all done, and canoe down the Kilchis in search of the wild and untamed Cutthroat trout. I lost an over 17 incher last week and I have to go find him. Can't wait to meet all of you fine people. Time to dust and vacuum. Yuck. I woke Saturday to a scattered handful of campers and tents in the yard. The wind was howling through the cracks of 'almost' closed windows. They had carelessly been thrown shut for the first time in weeks. Some showed up for 5:30 A.M. coffee, excited about being shuttled to canoe down the Kilchis for Cutthroat trout, others after the illusive salmon. As the sun came up we were ready for a fishing trip out at Bay City. I could feel my eyes try to blink against that cold wind as it zapped any moisture that was normally there. The Fall season cast a dim shadow against an otherwise clear sky. That eerie autumn glow. A few clouds drifted through the west. Not clouds that contained moisture, but a sheen of what looked like talcum powder that someone spilled at the horizon and had been blown halfway across the sky. The day brought excitement at first as we saw several fish landed. They weren't landed in our boat, but Jeff Whitehead, Bill and I, stayed hopeful for a hookup. They saw an eagle. I couldn't focus on it, but saw it well enough in my mind. Jeff is a delight to fish with, with a positive, 'let's have fun' attitude. I started that way. Very positive! As my enthusiasm dwindled, he kept me afloat with thankfulness for the beauty of the earth. The party was a delight! I have to admit, when 8 O'clock rolled around, I started to fade into exhaustion, but all I needed was to demand Bill sit down and hold my hand. He administered a spiked coffee and hugs. Just what I needed! Oh, the food! Oysters and salmon, smoked tuna and deep fried turkey! Hamburgers, hot dogs, chips...Pickled this and that, garden fresh veggies and pies and cakes! It was a Thanksgiving in true Oregon timing! I floated from person to person, hoping to spend more time with everyone, but I was frequently interrupted by hosting details. "Where are those name tags? Who needs a drink? Yes! I have a serving tray.. Where did I put my camera?" I think perhaps a week long campout is in order to get to know these wonderful people. I heard comments of trust from people. People not afraid to put their purses down in fear of theft. People instantly hugging each other. Fishing friends. I still hold to the fact that I have never met someone who fishes that I don't like. What better reason to have ifish? Bill and I kept repeating, over and over..."What nice people!" I have been paid and repaid for starting this site. My life is rich with fishing friends! I am so glad we did this party, and I can't wait until the next one. There was a lot of work to be done, but it has brought joy and satisfaction. I have great memories of people sharing food, hugs and fishing stories. I still see happy people huddling over the glowing barbecue coals as the chill of night crept upon us. The cold eventually forced R.T. and gang inside picking out tunes on the piano. People laughing, talking, eating.... Life is good! Ifish is good! Thank you, to all who participated in this event. It was your giving spirit, helpful attitude, and participation that made it what it was. Continue to fish and to share with others the joy and ethical practices of fishing. We share the love of angling and the universal concern for preserving the species. We have the power of numbers here. We can make a difference! I think, yes... we are on the right track! Seemed like things would never return to normal after the party. Now I realize that if I don't keep up on the boys school life, things pile up, they let things go too, and we all have to play 'catch up'. There are bunnies to try and find homes for, a kitty who needs shots, hundreds of e mails that need answers, web pages to update, oil changes on cars....need I go on? I am working on preserving the species! Fish are flopping around everywhere except for in our boat. I figure that God thinks I should leave a few this fall. Like all of the fish! As they say...."In His time..."
I've got to admit, every time I pray, I begin to thank him for all that I have, but darned if I can't help ask him for what I have not.... All I want, Lord, is a shiny sided Chinook! Oh, and one more thing, God... Rain? Thank you for this sunshine that brightens the sky.. Thank you for the flowers that bloom, the garden that still brings sugar snap peas to my table...But Father, could you please send rain? I want my flowers to look scraggly and unfed, for the forest to turn more brown, and the shadows to grow longer on the meadow. I want to live my days in a shaded canyon that holds more moisture than my sponge in the dish water! I want to hear my feet squish and sink into the mud as I walk down to the river, to wake to the sounds of a rushing river instead of the trickle of a creek. For all these things I ask, guilt follows. I am given enough of everything to keep my family happy, yet I still ask for more? Yikes.... Let me start again. Father, thank you for all that I have, and I will wait patiently for the next precious season that awaits us. The rain will come.........sometimes the anticipation becomes almost unbearable. But the rain always arrives. grow longer, the air is colder...........still fall waits for the rain. I know people who hate the rain, they see only dark, gloomy, boring weather. They truly are missing out. The rain always seems to wash everything new again, bringing life and change to our world. Trust me...........the rain will come. Hint 'o' the day: Fished the North Fork Nehalem down from Aldervale, and there are some nice silver jacks and some larger salmon playing around in there. Don't seem to be biting though. Make it your obsession to change their minds. Oh yeah! I can't tell you how proud I am of the members of the board. Everyone jumped to help out a young gentleman who needed help tying an egg loop. Even offered to take him fishing! I thought it would be fun to get someone to offer to take a teen fishing, and then hold a contest for youth to enter. Anyone game? Write me! Would there be insurance problems with this? I don't know. Let's discuss it. I didn't really want to leave the warmth of the down comforter after my long winters nap. After all, it is Saturday. There was no need to get the boys up to catch the school bus. Still the rain (yes, the rain) was insistent that I rise. The rain gauge called my name. 1.19 inches since 6 last night! I like my coffee stronger than Bill does. I used a different coffee scoop. I sat down at the table to read my Saturday morning Elinor Markgraf column. "How many scoops do you use with that old plastic scoop?" I asked innocently. "Two slightly rounded." Came the reply. "Not four?" I think I'll never hear the end of it. I escaped to my computer room, holding the dark, hot liquid in my hand. Rain on the roof and a cup of strong coffee in my hand. Life is good, even at six in the morning. The rain will wash the river beach clean of any signs of summer. Foot prints of kids dragging inner tubes. Tiny raccoon prints scattered by the shoreline. Beaver trails that led into the brush will be wiped clean. Any type of large cat like that tucks in his claws as he walks. I always watch for this because it is exciting to me to think that something so wild could be so near to us in our slumber. I have tracked elk through the same places where I see scattered deer prints. The kids have run screaming up to the house to show me what they perceive as cougar tracks on the beach. They drag me out of the house only to see it was Dee Dee, the black lab. There are the claws, I explain. Their enthusiasm fades. Rubber boots and coats are lining the utility room where beach towels and snorkels appeared even last week. I still hear the kids shrieking from the chill of the clean, cold watershed of the Kilchis River. They have been swimming regularly since May. Their favorite swimming hole is carpeted now by at least two feet of red and gold leaves. Ten feet down into the clear water you can see them. I can only imagine carpet that color and texture in my house. I wish I could bear the cold so that I could feel those leaves with my bare feet. Another sip of coffee takes me back to the warmth of my home and the persistent rain on the roof. Summer has been washed off the river beach this morning. Down the river it will go until it meets the sea. As summer floats downstream, it will magically signal salmon, steelhead and cutthroat to replace it's presence until next year. The kid season has gone. Now it's my turn!